One of our alleluia church family members, Kenny Hearndon, our former maintenance engineer says, “After I get out of church, I keep on churching”. That means there is an afterglow to what happens at church. Maybe it’s much more than an afterglow because of the realization that Christ has won the victory of everlasting life by His rising from the dead. We have immorality. Immorality is a gift that lasts forever and ever. When we cross over to the kingdom we win this gift of eternal life. Alleluia! While here we keep on churching. The more churching, we do, the more we are aware of loving and the more we are aware of God’s presence every time we celebrate Eucharis as a lasting pledge. Again, every day our immorality is all flowing from our wonderful God. Alleluia! 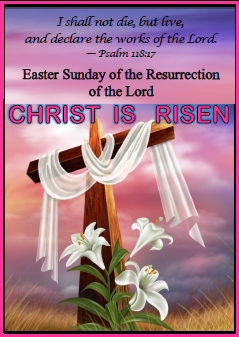 So, resurrection is about change, hope and victory with a feeling of being blessed all the more we are blessed. We look into what’s happening in our society today. I put before you four different occurrences that show resurrection. The kids in Florida, I should say the grownup kids in Florida, are ready to have a national campaign for gun reform and they are doing it. Certainly, a resurrection moment. Listed in the paper is a woman who said, “Because of all the challenges coming forth of respecting women in every way that she now feels like she has won a victory for many years of sly remarks, inappropriate touches that are called an accident and many other signs of sexism. Now she feels with the women that have come forth about women in the working place, a resurrection has occurred. Somebody told me that the opioid addiction kills 64,000 of our young people every year. This is one story about an addicted woman who found out she was about three and a half months pregnant. All of a sudden, she realized that she could pass this addiction and all troubles on to her baby. Therefore, he or she would have trouble in life. So she sought help and received it. The story goes on to say she has a healthy baby, free of addictions and she is on her way to recovery. A resurrection has occurred as it does in everybody that rises out of that tremendous, degradation to new life. Finally, Ferguson. Just mention the word and hopefully from that and all over the country there has been better policing policies of respect and some opportunities in job and education. More needs to be seen but resurrection has come out of ashes. So, church realize that in our second reading the man Cornelius saying, “Not to all the people did the Lord appear”. Reflect on not to all the people, but He has appeared to many, starting with a few of the Apostles, the Blessed Mother and other women and then to as many as they could so Christianity and this message of immorality won. It’s been spread throughout the entire world but, one by one. That’s the way our risen Lord and Savior has done it. Not to all the people but certainly to you and I, we spread resurrection victory. Keep it up. Alleluia!